SQUIDALICIOUS: Mali Likes Apps, Too. Here's Her Top Ten. You've heard a lot from us about Leo, his iPad, and apps. In fact my latest BlogHer post is on which apps Leo thinks are fun, as opposed to which apps support his communication and learning. But you know what? Leo has a little sister. And Mali likes iPods, iPads, and apps too -- with a fiery passion that is both a great motivator for chores, and a problem should anything require doing while she is mid-game or book. Here are ten of Mali's favorite apps, if you're looking for some Christmas Eve instant gift recommendations, apps for loading up that new iPad or iPod, or kindling for burning through those holiday iTunes gift cards. Stack the States ($.99) Mali will play this indefinitely, and is completely sucked in by its combination of state trivia and shape-matching with a stacking game. Earned points unlock new game levels. And it's fun -- our family played it together during yesterday's San Francisco to Las Vegas road trip. Only hitch: it doesn't pronounce the states' names in voiceover, so while Mali can now instantly name almost all 50 states' capitals, we still get an occasional "Ju-wah-know" for Juneau, Alaska. I hope the content gets even richer (State birds! flowers! Flags! ), and that a Stack the Countries app is forthcoming (former Geography software producer being wishlist-y here). Doodle Hangman (Free) Animated hangman word game. You can upgrade to a full paid version, but so far we've been quite happy with the categories, which include elements, countries, human body, and Kings & Pirates. She and Iz like to play this one together. Wurdle ($1.99) A timed word search app that lets you chain letters into words in any connected pattern you like. I am a bit bummed by how close her and Iz's top scores are to mine. Square Off (Free) Field of dots, close off square vs. the computer, different difficulty levels, strategy required. If I sound less than enthused it's because I hear this game's sounds effects in my sleep -- a testament to just how much Mali likes it. 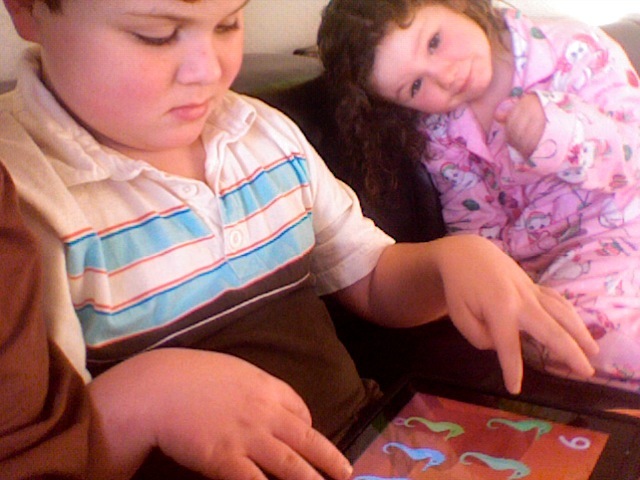 BrainPop (Free) Mali is all about iPad novelty, and BrainPop lets her watch a new educational movie every day (I actually downloaded BrainPop for her big sister Iz, but hey). Today's episode was about snowflakes, the science of how they form, and are they really all different. Nifty animation, built in quizzes, and bonus "Where did you learn THAT?" factor for parents. Cut the Rope ($1.99), Angry Birds ($.99), Finger Physics ($.99) I'm grouping these as they all combine physics with strategy. And they're all really popular; you may own all three already. There's a reason -- they're clever, crisply designed, fun, and fluidly animated. Seymour is amazed by her mastery of all three apps; she's much better than him. Stray Sheep: Poe's Christmas* ($6.99) An beautifully (truly) illustrated interactive book about a sleepwalking sheep's adventures. Mali's favorite part is when Poe meets the "man in red" (guess who?). She also likes the slider puzzles, and the Spot the Difference games (at which she is much better than me). Little Miss Spider* ($7.99) Even though this expanded interactive book is about spiders -- they would normally give Mali the willies -- she loves Little Miss Spider's video-quality animation and interactivity, as well as the matching game (though Leo is better at it), paint program, and the adjustable-level jigsaw puzzles. This is a high-quality production. All About Dragons (Free right now) Our girl is dragon- and fiery-creature-in-general obsessed. She used to play with/read this book every day when she got home from school; the only reason she doesn't refer to it as often is, I suspect, that she has it committed to memory -- she loves it that much. Other apps Mali likes: Snow Wonder* ($1.99) for building snowmen "with girl hair and girl faces," Zombie Farm, Plants vs. Zombies, Edge, Cupcakes, Pocket Frogs, Jelly Doodle, Doodle Jump. What apps do your kids like? If (ahem) Santa was to leave Mali a $10 iTunes gift card in her stocking, which apps should she download next? *Disclosure: gifted by the developer, but so were lots of apps that didn't make her favorites list. These are the apps she likes. Thanks for this list! I will check out some of the others later, but I just bought Poe's Stray Sheep for our Christmas Eve drive to the suburbs this afternoon! What a fun game/book! Kokuban chalk board is very popular around here. Although, the short person in this house wishes it had more color options for the chalk. Um, is it possible for her to be *any* cuter? Just wondering. And thanks for the recs! I have to say that Angry Birds didn't work for us. It is a big seller too! I know a little guy who is quite fond of Ragdoll 2 and Ragdoll shooter. As well as chop-chop soccer. Personally, I found the WordPress app to be a good idea (not such a good implementation yet). While not an app--I got a video cable this year. We can now watch videos on our TV from iPod touch or iPad. A nice gadget for traveling. Take the video library on the go or watch YouTube or Netflix. Charlie likes Pop balloonimals and the puzzle me apps. There is one that shows the animal from infancy on up to adult.